If we had a nickel for every time a customer asked us how to know when to replace their window treatments, we’d sure have a lot of nickels. And while that might seem like a straightforward question, there’s no straightforward answer, because every situation is different. With that said, if you’ve been thinking it’s time for new window treatments, odds are, it’s time. At Treasure Coast Window Fashions serving West Palm Beach, we’ll be happy to help you determine if you really do need new treatments and if so, what will be best. Speak with one of our representatives today. Broken, Warped, or Cracked Slats or Faded Fabric. Typically, those types of concerns are caused by UV rays, which can really have impact on older window treatments. However, newer treatments have protecting elements that reduce the impacts of UV rays. For example, Hunter Douglas Palm Beach™ Polysatin™ Shutters and Everwood® Alternative Wood Blinds are guaranteed not to warp or yellow. Duette® Architella® Honeycomb Shades are made from a polyester fabric with a white backing to eliminate fading. Dangling Cords and Hard-to-Reach Windows. Corded window treatments can present a choking hazard to children and pets. 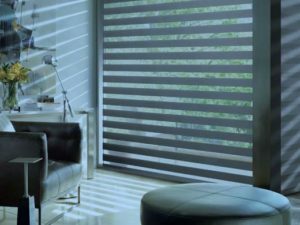 Hunter Douglas offers several cordless lift systems, including the LiteRise™ operating system and PowerView® Motorization. With PowerView, you have the added benefit of being able to adjust treatments in hard-to-reach windows. Problems With Raising or Lowering the Treatment. Over time, some blinds and shades can become difficult to operate. In some cases, they can be repaired. If they can’t, maybe it is time to see what is new on the market. Previous Homeowner Had Bad Taste. If you’ve purchased a new home and just can’t stand the window treatments the previous owner chose, it’s probably time to get something that’s more your style. Let our trained consultants help you find the window treatment that fits your décor and budget. Contact Treasure Coast Window Fashions today!